Hints of Spring weather are slowly getting me out of winter hibernation mode. This month is ushering in so many fun food events. It seemed like the perfect time to give you a look at what's new and what you don't want to miss. Chef Brian Lewis, who brought seasonal American cooking to Westport with his acclaimed restaurant, The Cottage, expands his footprint in downtown Westport with his newest venture, OKO. The Japanese inspired restaurant, located in the historic Vigilant Hose Company Firehouse at 6 Wilton Road, showcases Lewis’ innovative take on traditional Japanese cuisine and sushi, in a lively and charming atmosphere. The restaurant will open this Thursday, April 19. The food menu will feature several styles of Japanese-influenced cuisine, including Sushi Nigiri, Sashimi and Temaki (hand rolls), as well as vegetable tempura, seasonally inspired salads and vegetable dishes, okonomiyaki, homemade tofu, hand-cut soba and ramen specialties and meat dishes from the tepinyaki grill. A traditional Omakase menu will also be available, offering a spontaneous, multi-course menu of the chef’s choosing, as well as a “Chef’s Selection” offering of Nigiri Sushi, Sashimi or Chirashi Sashimi. Dessert offerings will include house-made soft serve ice cream, build-your-own sundaes and crepes filled with matcha crème. The beverage program will also celebrate the Japanese culture with seasonal, local ingredients. A robust offering of Sake, Japanese Beer, hot and cold iced tea, matcha and wine will be offered. Custom cocktails and Highballs will integrate traditional Japanese ingredients – sake, barley shochu, Japanese craft whiskey, and matcha – with spirits including gin, brandy, rye, and tequila. 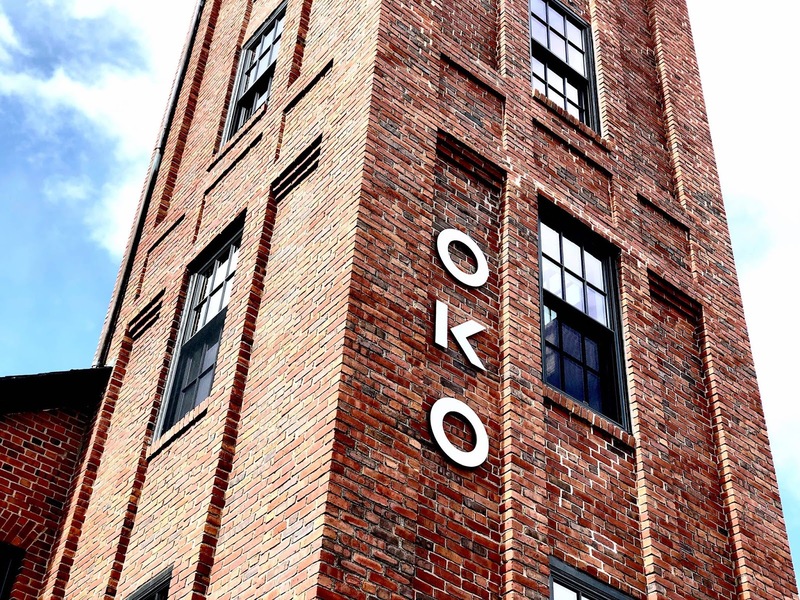 OKO is open Tuesday-Saturday (5pm-close) and in the coming months, will be adding Sunday service. The restaurant will also be offering take-out in the coming weeks. OKO accepts reservations via OpenTable.com, or by contacting the restaurant at 203-557-8404. Food Rescue US, the technology-fueled, direct-transfer food rescue organization dedicated to ending food insecurity in America, is thrilled to present their signature fundraising event, Food for All on Wednesday, April 25th from 6:30-9pm at Abigail Kirsch at The Loading Dock in Stamford, CT.
Norwalk Now, the collaborative marketing group comprised of local Norwalk businesses who have come together to promote their city, presents Norwalk City Hunt, an interactive, “amazing race” throughout the Wall Street and SoNo neighborhoods of Norwalk, Saturday, April 28 - Meet-up 10:30am, Hunt 11am - 1pm, After Party 1-3pm. Participants (adults only) are put into teams of 4 and are guided through the hunt on the City Hunt phone app. From there, a series of clues, challenges, and tasks are tackled with the successful completion of these activities being recorded or photographed on the team leader’s phone. Meanwhile, at City Hunt home base and the unknown location of the after party, City Hunt officials are monitoring everyone’s progress. 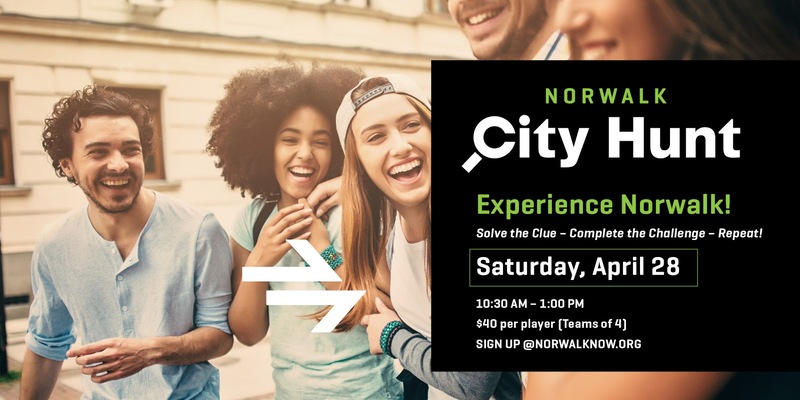 Participants will be walking, running, or catching a Norwalk Now Circulator Van, shuffling them between neighborhoods. The vans will continue to run throughout the day/night as part of a special promotion and trial run for future use. Destinations are comprised of Norwalk Now businesses, supporters, and public domains. The final destination is found by solving the clue. Upon completion of the Hunt, winners will be announced and the after party begins! Prizes include a $500 Norwalk Now gift card package and Free Parking gift bundles. Norwalk Now Circulator Van will continue service throughout the night and discount parking for the day will be offered. Go to the Norwalk Now Facebook to obtain the code. Plan b announces multiple events to celebrate National Burger Month. Starting today guests will have their chance to “Build a Better Burger” by submitting their best burger recipes in-store and online. 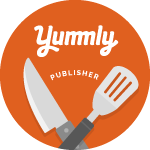 Four recipes per store will compete online and social media from 4/30 – 5/6 for a chance to go head-to-head the following week. The burger that has the highest in-store sales and online votes will be featured on the menu from May 18th - May 28th (one winner per location). The winner will also receive one free burger per week for the remainder of 2018, in addition to having their name and photo displayed on the wall of that location. Along with the “Build a Better Burger” contest, Plan b will partner with Budweiser to celebrate veterans. A $10 “Big Mini” and Budweiser special will be available every Monday at all CT and MA locations for the entire month of May, with a portion of sales going to Folds of Honor. Limited edition t-shirts will also be on sale for $20, with 100% of the proceeds going to the charity. 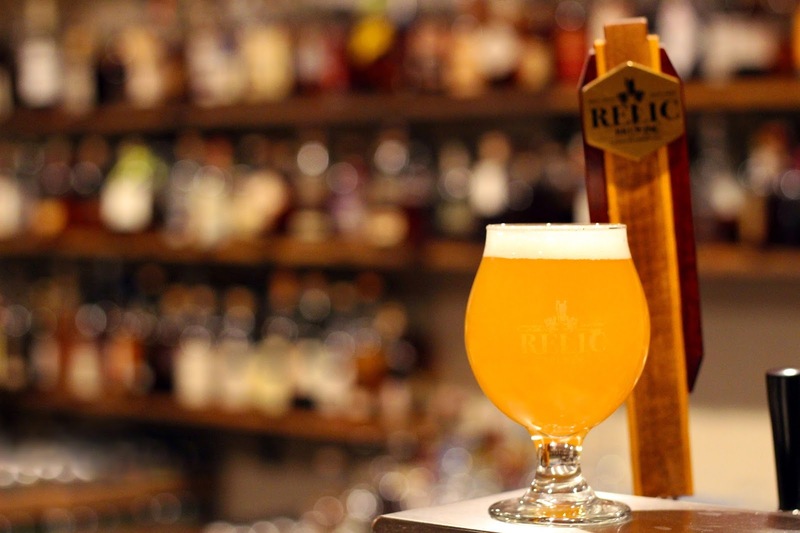 Relic Brewing has been brewing exceptional craft beers for 6 years and now has gilded the lily by adding an in-taproom whiskey bar to rival the best collections in the world. “Since August we’ve been quietly accumulating a truly world-class collection of fine and rare spirits to complement our beer, and we’re thrilled to finally get the word out so that people can come and experience this for themselves. What we’ve created is unlike anything we know of in the country and we truly believe is at the forefront of what’s new in the increasingly popular craft food and beverage scene. Our customers have so far been shocked, delighted and returning for more - more flavors, more education, and best of all, more fun," stated Mark Sigman, Owner and Head Brewer, Relic Brewing. Customers can order 1⁄2 oz or 1 oz pours of any of the 800+ spirits in the collection or can try one of the rotating whiskey, mezcal, tequila, rum, or gin flights. There are exceptionally rare offerings that draw aficionados from many miles away alongside a myriad of affordable choices. The Greenwich Wine + Food Festival presented by PepsiCo will return for its eighth year, hosting a Master Chef Wine Dinner on Friday, September 21 and a full day of food, drinks, music, and fun on Saturday, September 22 at Roger Sherman Baldwin Park in Greenwich, CT. This year, the fourth annual Serendipity Golf Classic presented by Pure Leaf, to be held June 12, and the inaugural Serendipity Fun Run presented by Aquafina, to be held on May 13, will also fall under the Greenwich Wine + Food flagship brand. The Greenwich Wine + Food Festival presented by PepsiCo will honor Alex Guarnaschelli at the Friday night Master Chef Wine Dinner, and welcome Scott Conant as a special guest, as well as provide live musical entertainment (TBA). Guarnaschelli is a Food Network star (“Chopped,” “Iron Chef”), cookbook author and New York City chef/restaurateur (Butter, The Darby). Saturday’s events take place in the Culinary Village, with the Grand Tasting tent at the heart of the festival. Guests will enjoy tastings and demonstrations from more than 150+ of the area’s finest food, wine, spirits experts, as well as other tents celebrating burgers, BBQ, tacos and more. They will also experience sommelier, mixologist and brewmaster presentations, celebrity book signings, Q + A sessions with top culinary experts, a celebrity green room with live interviews and an exclusive Meet the Masters’ Panel discussion with Scott Conant, Alex Guarnaschelli and more (TBA). 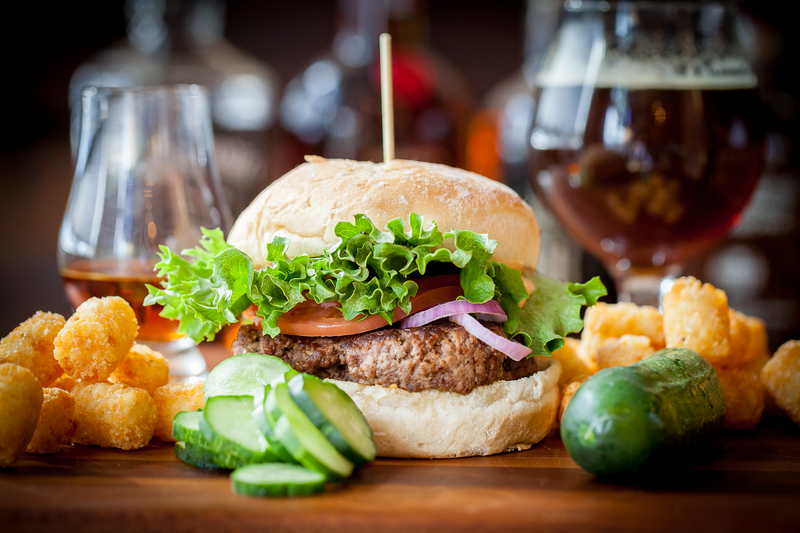 The 7th Annual Burger Battle will return, as will the 4th Annual Top Bartender Showdown, providing heated competition between area restaurants. The festival will come to a close with a headlining live musical performance (TBA). Tickets for the Festival All Weekend Pass, Friday’s Master Chef Wine Dinner, Saturday All Day Pass (General + VIP) and more will be available in the coming weeks via www.greenwichwineandfood.com or by calling 203.588.1363. The festival weekend will be held rain or shine, and anyone under 21, including infants or strollers, will not be admitted. Animals are also not permitted.